I thought I should give an update on Dash as his journey has been a long and difficult one. Dash continued to get better and was adopted by a really nice family at the end of February. Although being healthy when he left he didn’t do well in his new home. He had several trips to the vet which culminated in Dash having a CT scan that brought to light a surprising diagnosis. He had no nasal passage on one side and just a pin hole on the other side. This was interfering with his breathing and the only thing to be done was surgery to the tune of $3,500. The family decided they just couldn’t undertake that journey so Dash was returned to me on 3/13/11. He was *so* happy to see me when I picked him up that he practically jumped into my arms! He actually looked great……had put on weight and his coat looked fabulous and he seemed happy and not sick at all, except for the continually snotty nose. 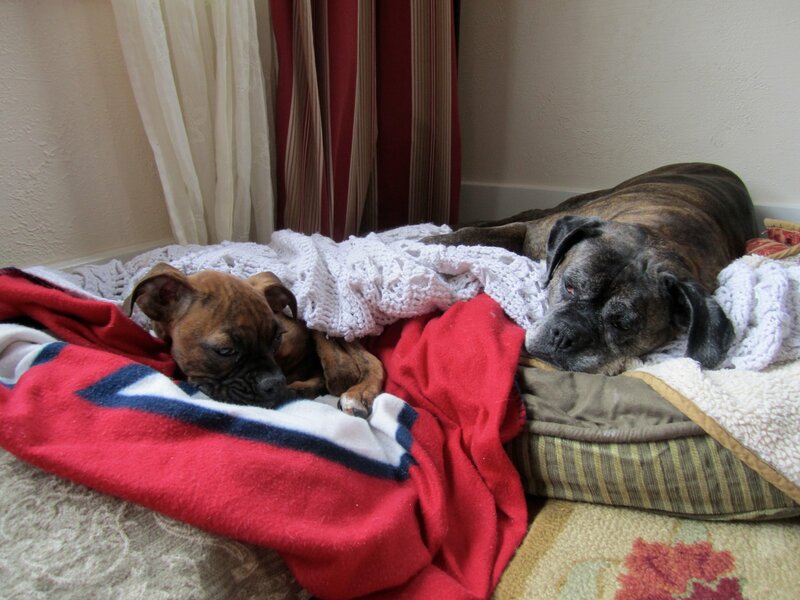 Dash and his sister Lady in his adopters home. 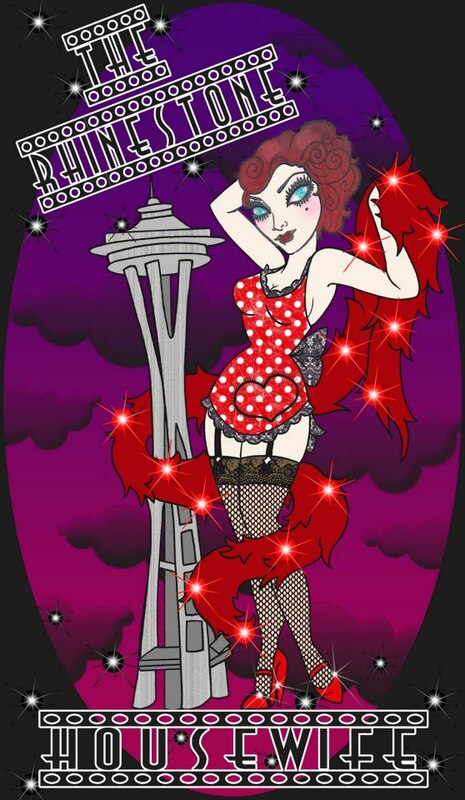 Now, all of this horrible news was coming to me as I was in Atlanta, GA for the Southern Fried Burlesque Festival. It’s really hard to get that kind of news (that your beloved foster pup was gravely ill and needs thousands of dollars of surgery) when you’re far away and can’t really do anything about it. So I got on the phone, DRAW started fundraising and I started calling in any favor I had with every vet I know. The response I was getting was that this was uncharted territory for the surgeons because they’ve never seen a pup live longer than 72 hours with this particular birth defect as pups need to be able to breathe out of their nose as they are nursing. Luck was on my side and I was able to quickly schedule a surgical consult with Dr. Fry at Cascade Veterinary Specialists for Tuesday, March 14th. Dr. Fry happens to specialize in this type of surgery with Pugs and Bulldogs. He told me it’s ‘terrifying’ and ‘gruesome’ because of bleeding and they would plan on doing a blood transfusion during the procedure. There would be a 25% chance that he could bleed to death during the surgery. *gulp* BUT Dash needed the surgery to survive so we scheduled it for that next Monday, March 21st. Dr. Fry was kind enough to charge just what we’d been able to fundraise for the surgery which was about $2,500 less than his normal fee. Dash came through the surgery like a champ. I was able to pick him up and bring him home the next afternoon. They sent off a biopsy of the stuff they removed to the lab. 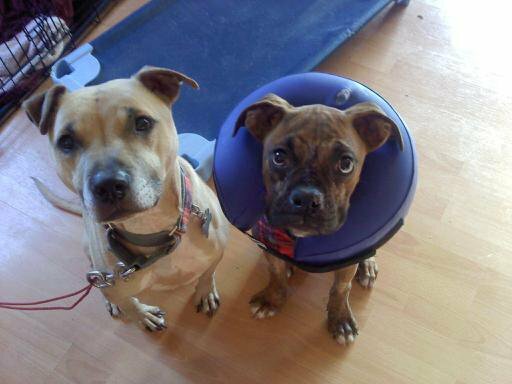 Dash’s recovery was remarkable, even though he had to wear the dreaded Donut Of Shame. He could breathe out of both nostrils right after surgery which must have been such a relief for him. 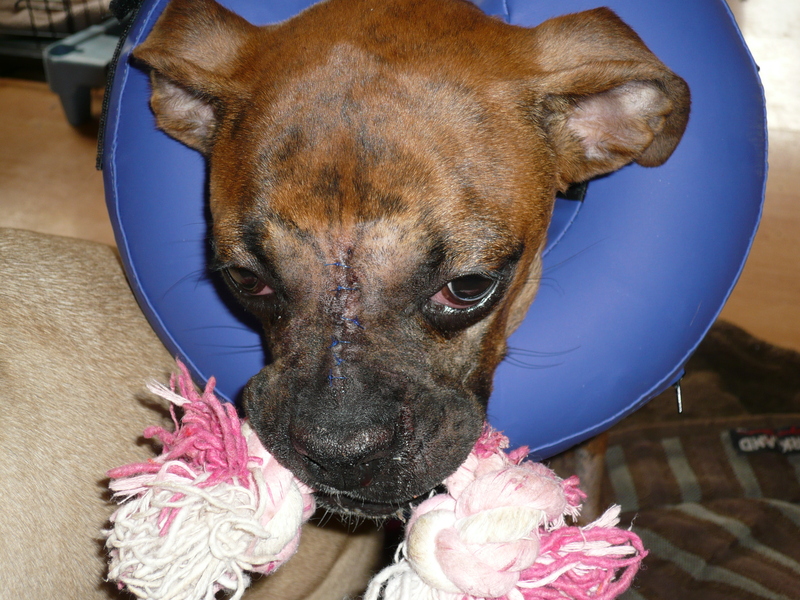 He had quite a bit of drainage and discharge which is typical of this type of surgery but he was eating and generally being a typical Boxer pup. His incision ran from his forehead down to his nose and he got pretty tired of me wiping the snot off his nose but he took it all in stride. Dash doesn't let a little thing like life threatening surgery get him down! On Friday March 25th we got Dash’s histopathology results back. The results were interesting to say the least. It wasn’t a birth defect but a cartilaginous benign tumor called a Chondroma. It’s rare to see a benign version of this tumor so once again we are in uncharted waters because we don’t know if the tumor will grow back. There’s no way to assure clear margins unless you also removed the roof of his mouth, etc which obviously isn’t an option. I choose to believe that the tumor will not grow back and that Dash will have many, many years of fun and happy ahead of him. Because of the ambiguity of his future I think Dash will be staying here and become an official member of the Fitzgerald family. He’s clearly likes being here and I genuinely enjoy having him around. He’s a really good and special puppy. Diana at Clackamas County Dog Services for taking in a sick little pup and nursing him back to health, Karin and her family for adopting Dash and spending a ton of money on diagnostics to figure out what was wrong, Dr. Steven Weinrauch at Banfield in Woodinville for putting in motion the plan to get Dash surgery, Dr. Brad Evergreen and all the staff at Evergreen Holistic Veterinary Care for always taking such good care of Dash and for the support for all the DRAW dogs and especially Dr. Fry at Cascade Veterinary Specialists for saving Dash’s life. 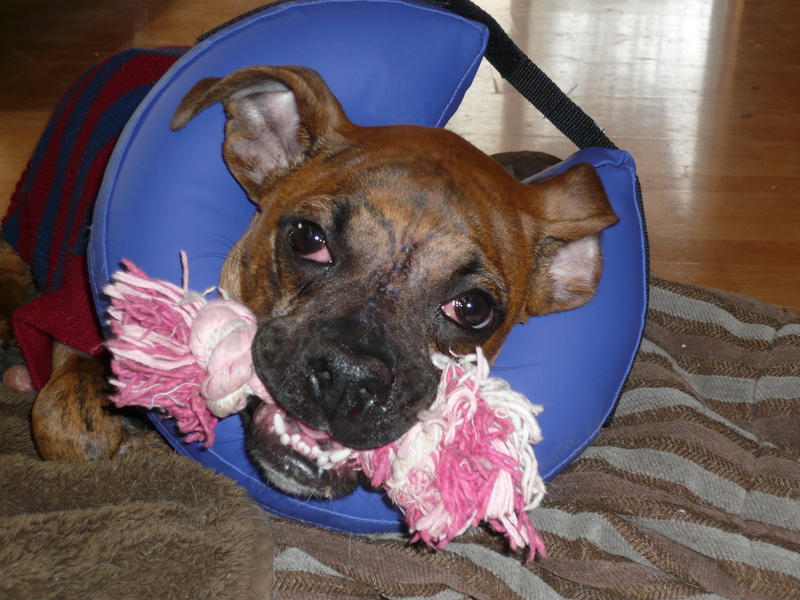 I’s also like to thank each and every person who donated money for Dash’s surgery. It really does take a village to save a puppy and I’m humbled and honored to have been a part of this scary and stressful yet wonderful journey.